Tag line: "What They Wanted Most Wasn't On The Menu"
Barry Levinson’s Diner is a movie about the nature of friendship. The film’s main characters, six twenty-something friends living in Baltimore in the late 1950s, spend a lot of time together. Whether at a dance or hanging out at the local diner, these guys always have a lot of fun. Take them outside the group, and not a one of them has all that much to say. Billy (Tim Daly) has just returned home from college to stand as Best Man at his friend, Eddie's (Steve Guttenburg) wedding, only to learn the marriage will be called off if Eddie's bride-to-be can’t pass a football quiz (more on this later). Boogie (Mickey Rourke) is a hairdresser who likes to gamble. In fact, he owes money to just about every bookie in town, and has to lay even more bets just to pay back what he owes. Shrevie (Daniel Stern) is a whiz at music trivia, and can tell you what song appeared on the flip side of every rock and roll single ever released. What Shrevie isn’t too keen on is making his wife, Beth (Ellen Barkin), happy. 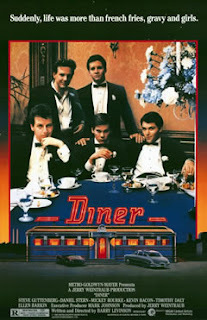 Fenwick (Kevin Bacon) is a rich kid whose family disowned him when he dropped out of school, and Modell (Paul Reiser), the comedian of the group, spends most of his time cracking jokes. Through these characters, Diner relates a story that goes beyond mere friendship; giving us six young men who are essentially at different stages of life. Shrevie is the only married one of the group, yet for him, marriage is an empty experience. He and his wife, Beth, have nothing to talk about, and at one point, Shrevie even yells at her for not taking an interest in music. Eddie's the next in line to tie the knot, but fears his marriage will also be bland and lifeless, which is the reason his fiance has to pass a Football quiz: to ensure they have something in common. A devout Colts fan, Eddie takes his football very seriously, and expects any woman he marries to do the same (interestingly enough, neither man spends much time learning the interests of their significant other). Fenwick comes from a background of money, and is very intelligent (while watching a television game show, he answers all of the questions correctly), but is also in the early stages of alcoholism, while Boogie, the spiritual leader of the group, is a compulsive gambler. In Diner, Levinson succeeds in building a strong camaraderie between these characters, which leads to moments that are both hilarious and heartwarming, yet in the end, it’s a bond that hasn't done a single one of them very much good. Strong as a team, each one falls apart whenever he must face the world alone. Diner is a fascinating character study of men at a crossroads in their lives; too old to be spending so much time hanging out together, yet not old enough to realize it. The daily responsibilities of life are only now starting to catch up with them, but when they’re at the diner, eating French fries with gravy and talking about Johnny Mathis and Frank Sinatra, the outside world melts away. They can still see it, of course, over their menus and through the frosted windows, but it doesn’t bother them in the least. And even when life does close in, it never really penetrates. Maybe it never will...if they always have the diner to protect them. How ironic, I have been planning on watching this a lot lately. Nice review, I now am even more excited to watch it. Adam: It's definitely worth a watch. Thanks for stopping by, and for the comment! Nice review. I agree that "Diner" is an excellent movie. Few movies have such a great ensemble cast. While the movie is funny and even a little outrageous at a few points, it always seems honest. Now I want to go watch it again. . .
@Chimesfreedom-Pophistory: "Honest" is the perfect word to describe this film. You may not always like how the characters behave, but it is definitely HOW they would behave in the given situations. Thanks for the comment, and for the kind words.